Hello, and welcome one and all to another addition to Your Digital Marketing Weekly Roundup archive. I’m still working, so you good people better be, too!! I don’t know about you, but I’ve been experiencing an increased number of direct messages landing in my LinkedIn inbox. As would be expected from a professional network, these have mainly come from representatives of B2B organisations, largely asking if I would be so good as to find room to comment on some solution or other that they have devised in my next blog. I must admit, I haven’t actually been so good enough as to oblige anyone as yet – though that’s largely down to time constraints rather than anything else. However, I have read the messages, checked out the senders’ profiles, and sometimes taken a look at the solutions and services that they’ve been trying to alert me to. The point is that, although I haven’t done any favours so far, I have at least been made aware of a few new things that are going on. And my conclusion is that Direct Messaging – on LinkedIn at least – works. I’m not so vain as to flatter myself into the belief that I’m the only blogger to whom these people have reached out. Rather, I suspect that they are playing a numbers game – i.e. reach out to as many as possible, one or two might bite, but even the ones that don’t will at least have been informed that our business exists. In short, such tactics, I believe, are successful, and if you’re in the B2B realm, then they jolly well might prove effective for you, too. And so my delight is formed off the back of these encouraging signals as I now draw your attention towards LinkedIn’s new Conversation Starters – let’s take a look at the video. It’s true – not enough of us actually take this approach to marketing. We’re all too focused on inbound. And that stands to reason, of course, for inbound is the way to market in 2016 and beyond. However, it’s not the only way to do it, and outbound methods will always have their place. Initiating conversations is a form of outbound – but, I believe, a valuable one. Check out this new feature, experiment with it, break the ice with some old connections, and see where it leads you. New partnerships could be just around the corner. Engaging with followers is of course one of the most important parts of the marketer’s day-job. Building relationships and encouraging conversations surrounding our content is indeed a large part of what content marketing is all about. However, comments sections can be pretty rowdy places at times, and we need to monitor them and, where we can, influence some control over the directions that discussions are heading. However, sometimes, a bad apple emerges, determined to destroy all the good work that we’re doing. Now, let’s be clear, if you’re receiving negative feedback on any of your social networks from followers or customers with a genuine grievance, I am by no means advocating that you should delete the messages in some sort of misguided effort to save your reputation. If you do this, then your customer will be personally affronted that you are not taking his/her complaints seriously, and will simply find another social channel where they will be well within their rights to chastise your business and customer service policies in particular. However, we all know that there are trolls out there, i.e. people who seem to make some sort of career out of needlessly and often unjustifiably hounding other users, including businesses. And so it’s a good job that Instagram has now introduced a range of comment moderation features that will help you nip any of these malicious offenders in the bud before they have a chance to bloom into something much more poisonous. “Comments are where the majority of conversation happens on Instagram. While comments are largely positive, they’re not always kind or welcome. Previously, we launched the ability to filter comments based on keywords. This was an important step in giving you more control over your comments experience. However, there are two more features we think will improve this experience. “We’ll soon add a way to turn off comments on any post. Sometimes there may be moments when you want to let your post stand on its own. Previously this was only available for a small number of accounts. In a few weeks, it will be available for everyone. Tap “Advanced Settings” before you post and then select “Turn Off Commenting.” You can also tap the … menu any time after posting to turn commenting back on. As I say – use these updates sensibly when they become available. That is to say that ignoring or deleting comments from genuine customers with genuine complaints is not going to do any good at all – in fact, you will only do yourself damage in the long run. However, if you do find you’ve got a troll under the bridge, you can now turn them into stone. Reading the Instagram blog, I’ve noticed one further update to the platform that I feel is important to draw your attention to, even though it is not marketing-related. I quote the paragraph verbatim and include the screenshot provided. As regular users of social media, it’s not uncommon to come across these sorts of issues with other users from time to time. So, I’m just going to say this – let’s look after one another, and help everyone stay safe. That’s it! 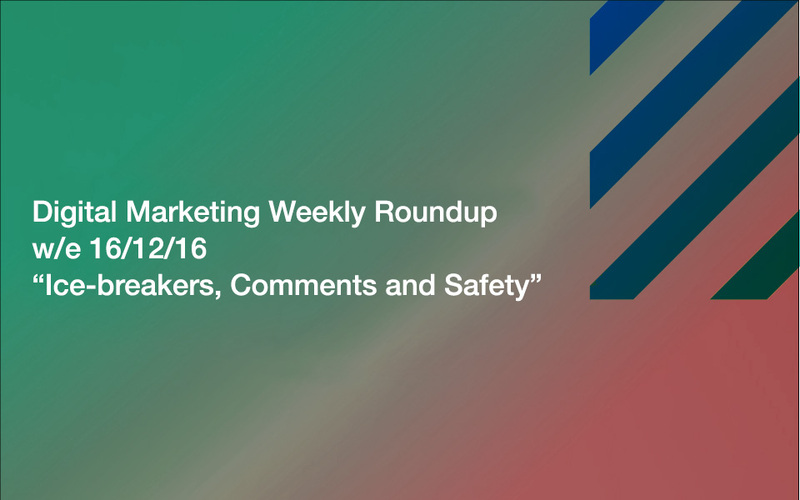 See you all next time with another Digital Marketing Weekly Roundup. Merry Christmas, everyone!